A broad range of leading technology companies use SPIP™ in their R&D divisions, typically within life science, process development, failure analysis and materials development, covering both soft and hard materials. In these companies, SPIP™ is used for analysis of particle or grain sizes of metals and polymers, defect analysis of semiconductor wafers, measuring critical dimensions of semi-conductor structures, characterization of co-polymer blends and networks, mapping of elasticity or adhesion of polymers of e.g. skin or cancer cells using force curve analysis, analyzing roughness and texture of metal alloys or semiconductors, and quantification of lubrication volume of metal surfaces. Furthermore, the batch processing and automatic reporting options is crucial for setting up a number of standard analyses. It is common that researchers use SPIP™ for analyzing data from many different instruments (e.g. scanning probe microscopes (SPM), electron microscopes (SEM, TEM), stylus and optical profilers) thus being able to rely on a single software package for much of their work. This reduces the amount of training necessary and it makes developed procedures more generally applicable and long lasting. Furthermore, the extensive use of a single advanced software package, such as SPIP™, increases the knowledge level of that software in the company and thereby the value gained by using it. consultancy and services to a broad range of industries including energy, oil and gas, maritime, manufacturing, medical and infrastructure. Furthermore, the company offers a wide range of services and solutions for the plastics, composites and rubber industry based on many successful co-operations with key players from the industry. Examples are co-operations on aspects such as advanced surface characterization and material properties, e.g. in relation to durability and degradation in use, or the application of new plastic, composite and rubber materials and advanced surface coatings and surface structures. “I am a very satisfied user of SPIP. I apply it for analysis of 3D images and SEM images, and other optical microscope images. In our department, we use SPIP in a variety of applications, such as measuring porosities in thermally sprayed coatings and characterization of nanometer sized holes in molecular sieve filters. 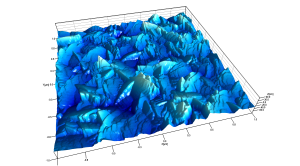 In 3D microscopy, SPIP is our standard software for evaluation of roughness of curved surfaces, and in evaluation of wear and corrosion attacks both on real samples and on replicas of surfaces of for example off-shore pipelines. We have also used the software to evaluate both confocal and AFM images of micro- and nano-structured patterns produced in plastic and metal surfaces". The DuPont Experimental Station research and development facility in Wilmington, Delaware was established more than 100 years ago, and today, the Experimental Station serves as a key research site for DuPont. Scientists and researchers pursue science-based solutions for global markets including agriculture, nutrition, energy, transportation, electronics, safety and protection, construction, and performance materials. “I have been using SPIP since around 2009. We have multi-user licenses and I have trained many of my DuPont colleagues to use the various parts of the SPIP package. We use it for its intended use; to analyze data and images from several different scanning probe microscopes, but we also use it to analyze images from optical and electron microscopes and data from optical and stylus profilometry instruments as well. The package is extremely powerful and I have not found a type of data file that cannot be imported or read by the software. The particle and pore analysis is particularly powerful and we have used it to statistically analyze nano-and microparticle size and shape from atomic force microscope and electron microscope images. We also use the particle and pore analysis to calculate wear volumes and quantify scratch damage and healing on the surface of polymers. The new profile analysis package is very intuitive and powerful, it allows us to compare profiles from many different tools to understand the size and shape of features at a variety of different length scales. It even enables correlation between surface morphology and optical images to understand the appearance of surfaces and defects.